Strategy games are one of the most popular genres in the video games. It is also considered as one of the oldest game types and its history goes back to the times of ancient civilization. In modern times, the gaming industry has evolved a lot with the rise of Strategy games for PC and mobile. In strategy game genre, a player uses its thinking skill and plans a choice that determines the outcome of the game. Chess, Board games, card games, and Checkers are some of them. 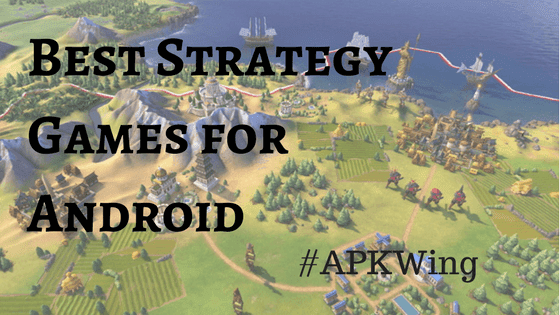 Here's in this post, take a look at 17 Best Strategy games for Android. Age of Civilizations is a turn-based strategy game for Android in which your aim is to dominate the world by capturing other territories and declaring war on civilizations. You'll have to protect the capital and if you lose it for 3 turns, your civilization will no longer exist. Capture as many capitals as you can as it will give you all its provinces. Construct, recruit, build, and move units from one province to another. This will cost you money and population as recruiting from one province will reduce its population. If a civilization agrees upon a peace offer you offer, there's no longer need to be at war. If the pact is accepted, the civilizations cannot attack each other for 5 rounds. Real-time war tactics need to be applied while playing this game. You can play it offline or online with your friends in Hall of fame. There are many scenarios you can find like World War I and World War II or you can create your own custom scenarios. It is one of the top-paid strategy game and is available in more than 16 languages. Bloons TD 5 is one of the top-paid strategy game in Google Play store in which you have to defend your tower from the invading enemies. Prepare your force to stop the Blooms from capturing your tower. In this android game, you'll build awesome high towers, hire intelligent special agents, choose your upgrades, and kill every invading Bloom. There are more than 21 powerful towers, 50+ tracks, 10 special agents, 250+ random missions and much more. This game is updated regularly so the Bloons TD 5 remains fresh and challenging for many weeks to come. This game can be installed from the play store with a purchase of $2.99. When it comes to the strategy game, how can we miss the epic Clash of Clans, developed by Supercell? Well, it is one of the most played clan games with millions of users ready to fight online. Players have to build the village, defend it, train your troops to fight them into battle. In this strategic virtual reality game, battles can be fought with players all around the world and take their trophies. There are many new characters and villages in all new hidden world. Fight with Barbarians, dragons, Sneaky Archers, Giants, and many more. Clash of Clans is free to install from play store, however, some items can be purchased via an in-app purchase. Battle of Polytopia is one of the best turn-based Android strategy game and is quite fun and addictive game to play. You will fight evil AI tribes, explore new lands, master new skills, and rule the world. Every map is autogenerated with an all-new experience and gameplay. Explore the Kickoo jungles, Wander in the dark forests of Barduria, and claim the imperious empire. With the latest update, the developer has introduced the multiplayer game where you can challenge and fight players around the world. You can also expect some great features in the future updates. This game is worth a try due to its civilization building style theme. XCOM: Enemy Within is an expansion to the award-winning turn-based tactical game XCOM: Enemy Unknown. It offers more new gameplay content to the base game including new soldiers, enemies, maps, missions, and multiplayer mode. There's a new technology included that allows genetic modification of soldiers and crazily advanced cybersuits. This expansion adds new weapons and equipment, new enemy threats, new strategic resource, new story elements, new multiplayer maps, and more. This game is a highly advanced graphics game and requires at least 3.13 GB of storage. You can buy this game from play store at $9.99. The list of Best Android strategy game can't be completed without mentioning a board game and the Chess Free by AI Factory Limited is the best in its genre. It is one of the top-ranked free Chess game on Android. Even if you've never played chess before, this game is just ideal for beginners to get used to the rules and improve your chess skills. There are 12 play levels starting from novice to expert that makes it good for beginners and experts. Chess tutor feature shows the next recommended move so that you avoid simple mistakes and develop your chess strategy. Analyse your move, think of the next 2-3 steps and then move your player. You can also play this game with your friends via multiplayer mode. Vainglory 5v5 is a real player-vs-player multiplayer game that can be played with friends or solo. Fight with an army of epic heroes, dragons, and allies and kill the enemy hero. It has the best graphics with 120 FPS highest on mobile. Experience the 5-minute BRAWLS to the full 5v5 battle. The main USP of this game is its best in its genre graphics. Vainglory offers real-time MOBA combat fights against bots or real players. It has more than 37 playable heroes and skins that can be unlocked while playing. Find or build teams to have fun and earn more rewards. The game offers the most responsive control in its genre with just a tap to attack, move and use other abilities. Castle Clash is one of the best strategy game for Android developed by makers of Lords Mobile - IGG.COM. It is also similar to clash games in which you have to defend your village, build an invulnerable fortress, and gather your forces for a challenging clash. You can equip powerful heroes and lead them into battle. You have to make a balance between attack and defense, so plan your strategies accordingly. There are many new heroes and areas available in the updated version. Lords Mobile is a popular real-time strategy game for Android developed by IGG.COM. In this game, you'll clash with more than 100 millions players online globally. You have to build your empire, explore magical villages, fight powerful enemies, make new friends as your allies and fight together into battle. Claim the throne and rule as an emperor. Prepare a strategy for the clashes, recruit powerful heroes into your troops and win as many battles as you can. Mafia City is a real-time strategy action game where you have to control the city and rule as the Godfather. Like other strategy games, it lets you play with millions of players worldwide and rule the city. Plan, fight, occupy, loot, and upheavals between gangs, intrigues, and compete for the honored position of King of Mafias. If you don't crush your enemies, maybe one day they'll crush you an occupy your seat. The game revolves around your struggle for power and your journey to become the Godfather. Make friends for fighting enemies so that together you'll corner out your every enemy. The game server supports professional translation system that translates all languages into one. Hearthstone is one of the most popular card strategy game in which you will unleash powerful cards to sling spells, summon minions, and seize control of the battlefield. If it is your first card or you're a pro, the gameplay of Hearthstone will keep you engaged all the time. Win and collect hundreds of cards and craft your deck. If you're a beginner, take part in practice matches against computer-controlled players of the Warcraft universe. When you've made yourself familiar with the cards, step into the Arena and duel other players around the globe to win great prizes. This android game is free to play and requires at least 2 GB of free space on your device. Plague Inc is one of the best strategic simulation game for Android where your objective is to inject the world by spreading a deadly Plague to all the humankind. First, you have to develop a virus that can infect the whole world with the deadly disease and then spread it to wipe out all humanity. It is one of the best-rated Android game with over half a million 5 star rating in Play Store and also featured in many newspapers and won many game awards. Awesome HD graphics with a highly polished gameplay. There are 12 different types of disease to develop with full save/load functionality, 50+ countries to infect, and hundreds of traits to evolve. The developers have released the expansion updates adding the mind controlling Neurax Worm, zombie producing virus, and much more. Plants vs Zombies Free is one of the most downloaded strategy game for Android in which you have to stem a zombie attack by planting powerful plants in your yard. A horde of fun-loving zombies is going to invade your home so you have to defend your house by using zombie-zapping plants such as peashooters, wall-nuts, cherry bombs and more. There are 50 different level filled with adventure and fun. Every zombie has a unique skill and requires unique strategy to take them down. You can use the Almanac section to understand the abilities of all the different zombies and plants, then strategize your plan to kill them. It has more than 100 million installs on the Google Play store itself. How can we ignore Kingdom Rush when we talk about the best strategy games for Android. In this epic fantasy action defense game, you have to defend your kingdom from the hordes of orcs, evil wizards, goblins, demons, and other enemies. Upgrade your defense strategy as you have to fight on mountains, wild forests, and wastelands. There are many things you can do in Kingdom Rush such as rain fire your enemies, recruit new warriors, command your troops, use magic spells, and face legendary fighters in order to save the Kingdom from the evil forces. The key to winning in this game is to build and improve your buildings as building help you attack enemies from a distance with arrows and improve your defense. This game has won many awards and is rated 4.7 on the Google Play store. Boom Beach is another great Android game developed by the makers of Clash of Clans - Supercell. Storm the beach and defeat your enemies with a plan or go in defeat. Strategize the plans carefully in order to conquer the enemy island. You'll capture the enemy bases and free enslaved islanders, join them into your forces. Build a strong task force with players all around the world to defeat the enemies together. Even after capturing the enemy bases, you have to upgrade your defense to save your island from other players. This game is free to download though some items can be bought via an in-app purchase. Vikings: War of Clans welcomes you to the violent world of Vikings where you'll rule as a fearsome leader and conquer other worlds. You'll conquer other worlds that are ruled by other players around the world by defeating them into battle. Apart from this, you'll build strong buildings train your warriors and boost your coffers. Don't fight stronger player at the initial stage of the game as you'll not stand a chance against the experienced players.This game has got it all to have you hooked all the time. It is also a free-to-install android game from Play store. This is one of the coolest strategy game out there in which you'll protect your empire from the army of zombies that are coming to steal your resources in the Last Empire - War Z RPG game. You'll build an army by joining with other players around the world and plan an attack together. It is a zombie-themed strategy war game where you have to survive and prepare yourself for the upcoming zombie war. Make an alliance with other players to build a strong army with zombie and human troops in order to defend your empire and destroy the enemies. This android game is free to download and play though offers an in-app purchase for some items. If you think I missed some of your favorite games, please mention them in the comments below. I'll add it to the above list. If you like this information, please share it with your friends.